"WHAT IS WORSTER-DROUGHT SYNDROME (WDS)?" Worster-Drought Syndrome (WDS) is also known as ‘congenital suprabulbar paresis’. It was named after Dr Cecil Charles Worster-Drought who first discovered the condition in 1956. 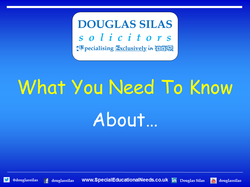 WDS is a recognised but rare form of Cerebral Palsy which affects the bulbar muscles. It causes problems with a child’s mouth and tongue, normally impairing their ability to swallow. The main problems occur with the mouth, tongue and swallowing muscles as a result of the bulbar muscles being affected. There are usually no obvious causes in pregnancy or at birth but some conditions are genetic. Due to the range of problems that can be caused, a firm diagnosis is often made quite late. As the condition is not well known about families can often feel isolated. Problems can either gradually improve over the first two to three years but can sometimes remain much longer. "WHAT ARE THE SYMPTOMS OF WDS?" The first sign of WDS is usually where a baby has difficulties with feeding, is unhappy and irritable and does not sleep well. In fact, feeding can sometimes cause choking and inhalation. These can lead to chest infections and, in severe cases difficulties with sucking, may require tube feeding for periods of several months. Early malnutrition is a significant problem for many children with WDS. Asthma is very commonly diagnosed but many episodes of wheezing may actually be due to aspiration. Symptoms can include difficulties with voluntary lip, tongue and palate movements. Sometimes there are also abnormal shapes in a child’s jaw and tooth alignment meaning dental care is very important. Arms and legs can sometimes show signs of incoordination and mild spasticity with some feet abnormalities. The main problems normally come about when solid foods are tried. As the ability to chew and swallow are often impaired, WDS can lead to food being inhaled into the respiratory tract because it is not moved to the back of the mouth or cleared properly. Due to swallowing problems there is also higher chance of middle ear infection and conductive hearing loss. A child with WDS usually has a severe speech delay which can even prevent them from developing all early speech. They may have persistent dribbling (although there is usually some improvement.) Speech and Language Therapy is often required and occasionally medication or surgical intervention is also needed. Some children can be diagnosed as having Dyspraxia. In some cases Epilepsy can also occur. A child’s whole development can be slow and they can show a significant lack of social responsiveness. There may also be a delay in the child walking or running and ‘clumsiness’ or difficulties with fine motor skills can be present. A child may need Occupational Therapy or Physiotherapy. Advice from an experienced paediatric physiotherapist and occupational therapist is often crucial in dealing with specific issues like the development of independent feeding. Many children with WDS also have learning difficulties and/or emotional and behavioural difficulties. They can also have a degree of ADHD. Children suffer with mood problems as they get older and some children have features of Autism. "MANAGING A CHILD WITH WDS"
Fortunately, WDS is non-progressive. Managing a child with WDS will depend upon their degree of feeding, speech and physical problems. Children diagnosed as having WDS can have a wide range of abilities Specialist integrated intervention from therapists, medical practitioners and educational professionals may be needed due to the possibility of multiple impairments. Educational provision also has to be considered very carefully because of the multiplicity of problems which a child with WDS has. Cognitive impairments can vary quite widely but are not usually severe. Children with WDS usually present as having early language delay and a global mild to moderate later impairment but they can also be difficult to place educationally because of their poor communication skills, behaviour problems and motor organisational difficulties.